Kira and Bashir wind up in the mirror universe, where the station is a far less hospitable place. For this episode, DS9 picks up one of TOS's most beloved plots--the mirror universe from "Mirror, Mirror"--and elaborates on the far-reaching implications of Kirk's influence. Though I wouldn't call this a particularly poignant story--it has far more entertainment value than thematic potency--it does raise some interesting questions about the ethics of interference. Whenever Starfleet tries to inject itself into the internal affairs of another culture, it's always portrayed as a bad thing (not to mention the Prime Directive), but how does the mirror universe fit into that line of thinking? Kirk's influence had enormous repercussions, as shown here, and it's interesting that the mirror universe has set up rules governing what to do when there's a crossover, but the prime universe has not. It's a good idea putting Bashir and Kira together, as they have had very few interactions on the show thus far. Unfortunately, aside from the opening scene, they have very little time to develop a rapport. The mirror universe gives the writers a lot of freedom, because the audience is willing to accept a whole lot of narrative convenience and elaborate mythology building, all for the sake of a good yarn. Probably the most interesting way of looking at this episode is from Kira's point of view. The alternate universe Kira is, essentially, Dukat, and the prime universe Kira has to face the possibility that somewhere deep down, she is capable of being as evil as the man she considers most unforgivable. This is how episodes like this work. If the writers shuffle around their characters, it forces both them and the actors to really stretch these people into new and interesting territory, and even if all you see of a known character is his or her mirror counterpart, the subtle effects of that character are felt well into future stories. I really dig the mirror universe, and this episode begs you to wonder what must happen to it after the prime Kira and Bashir depart, showing them this wormhole they didn't even know existed. 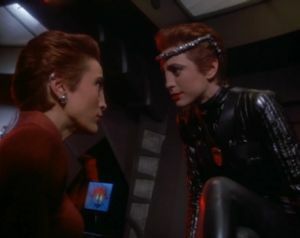 Kira explains to Sisko at the end of this episode that they've been "through the looking glass," which is a nice tease for the next mirror universe episode: "Through the Looking Glass." Copyright ©2013 e. magill. All rights reserved.